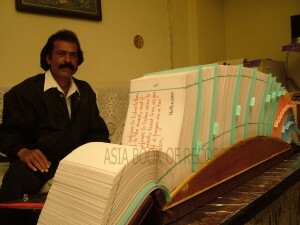 Sunil Joseph of Bhopal (India) has handwritten the biggest Bible. The holy book consists of 16,000 pages and weighs 61 kg in total. He wrote 7,957 verse of the entire New Testament (each verse on a different page) in just 123 days, staring from August 16, 2005 and ending on December 16, 2005. Comments for THE BIGGEST HANDWRITTEN BIBLE are now closed.